I hope you had a wonderful Thanksgiving (or Thursday for my non-American friends) ;) . 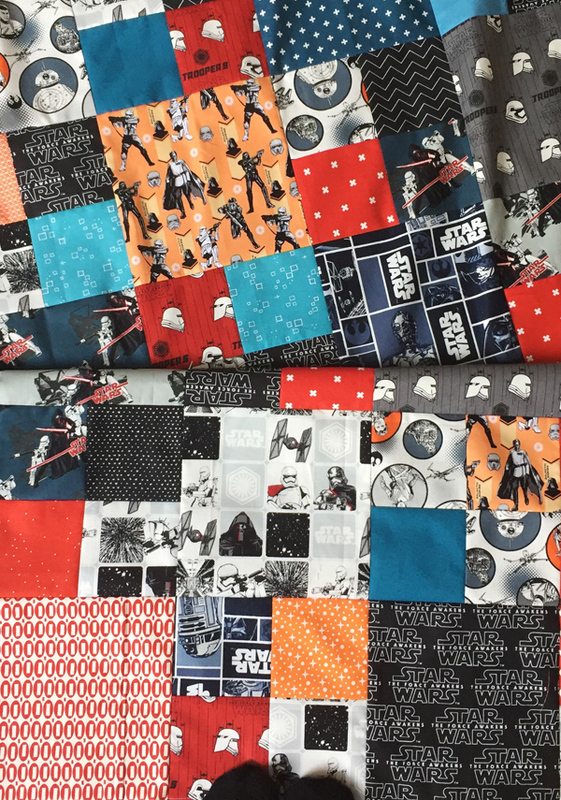 My only gift to sew this Christmas is a twin size Star Wars quilt for my favorite 6 year old. 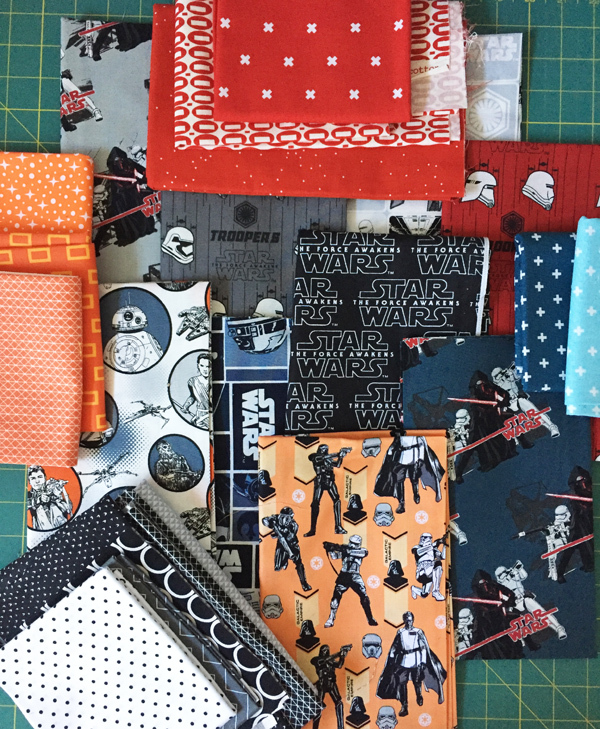 Most of my fabrics are from Fat Quarter Shop (just search Star Wars). I was going to hold off and post this quilt after I had some “styled” shots so you can see the whole thing…but I couldn’t wait. I had to be sneaky making this one with the kids around…and if Sophie saw it she would tell Ryan immediately. 4 year olds are SO bad at secrets. The fabrics are so busy and I wanted to use all of the prints…so I kept the pattern very simple. The big squares are 8 1/2″ cut, and the small squares are 4 1/2″ cut, and sewn into a 4 patch. Easy peasy. I used the softest blanket from Target on the back. I also used batting, so I sent this one to Kathy to quilt and asked her to do some simple wavy lines so it wouldn’t be stiff. If you’re interested in using a blanket for a backing…I have some tips and info at the end of this post. It’s all wrapped up under the tree but I promise a full picture after Christmas! 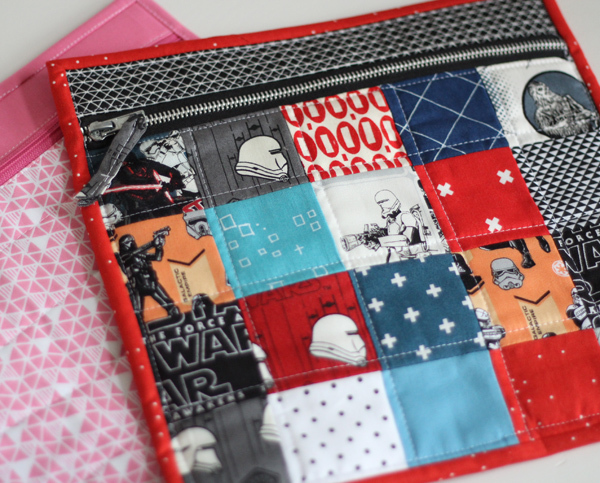 I used the scraps to make him a zipper pouch, and then I couldn’t stop and made a few more for gifts. I used this pattern/video by Sherri and it’s awesome! Except I used a metal zipper and broke two needles as I kept forgetting and sewed right over it. If you made it through this extremely long post and you need a weekend project (ha!) 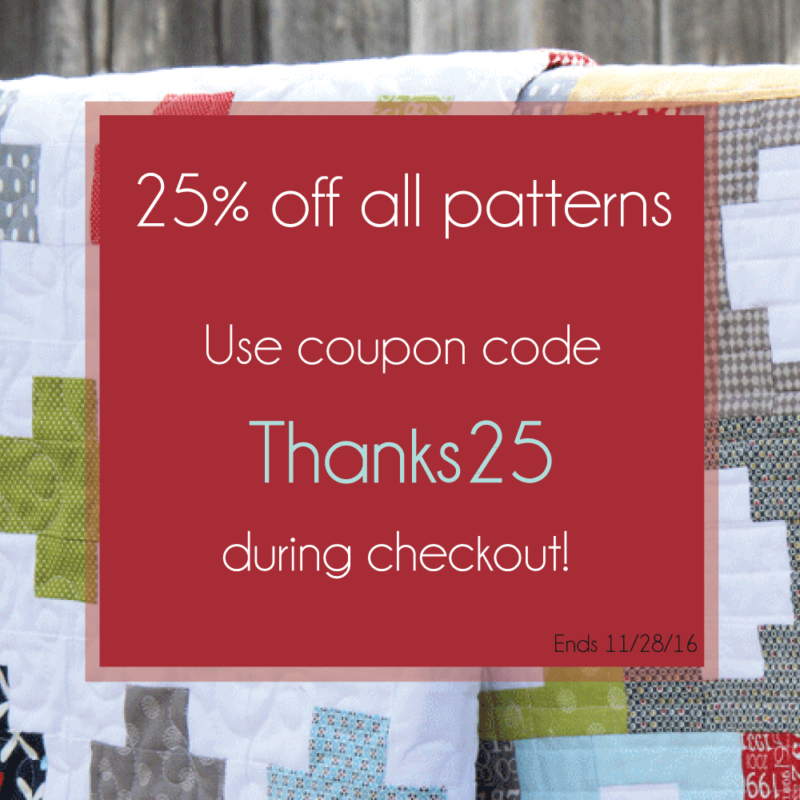 patterns are 25% in my shop. Use code Thanks25 through Monday. 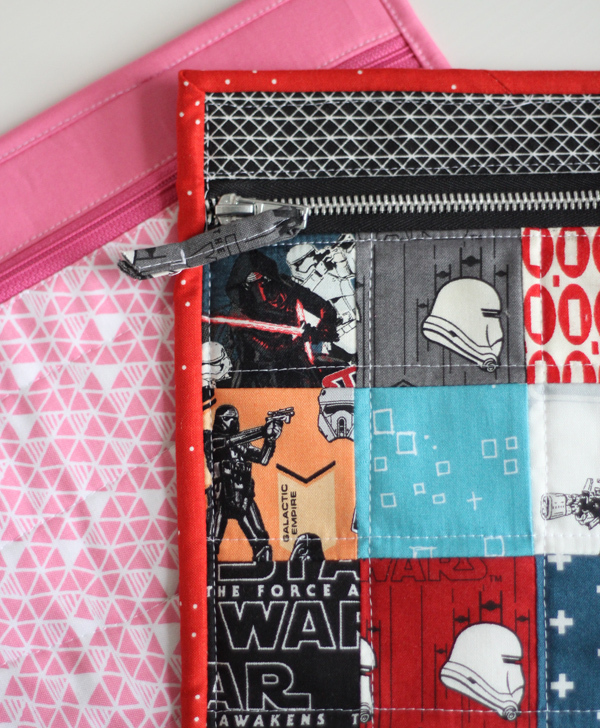 That Star Wars quilt looks so soft! Thanks for the reminder and link for the zipper pouches. Love a fast and practical project! 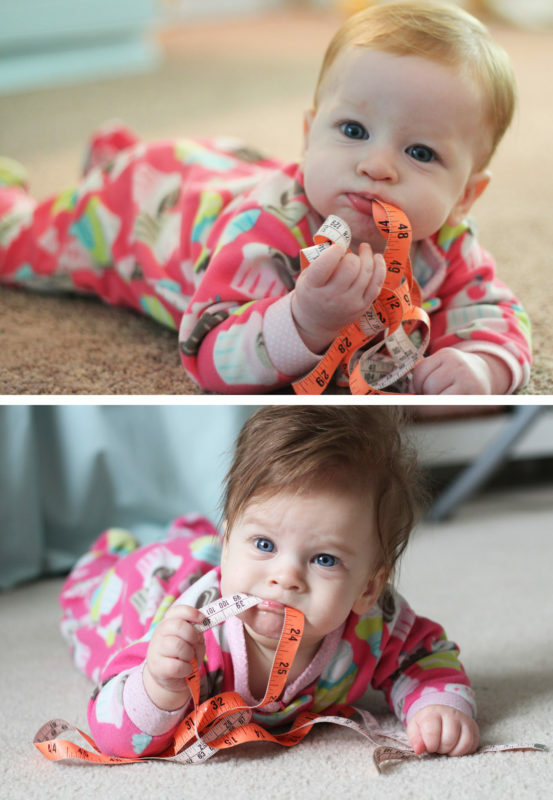 Baby pictures are adorable! Not really…she still has the craziest hair! I have to wet it down each morning and brush it, and stick it in a clip so it’s not wild and in her eyes LOL! Hope you are doing well!! We do have all the hair colors covered!! I was hoping Jane would get Ryan’s blonde curls…but I think she has stick straight dark hair like me instead! ;) I only got this quilt done so early because I will leave everything else until the day before Christmas LOL! I hope you are doing well!!! Oh, those little red heads! Too cute–what luck to catch them in identical poses (early signs of sewists?) and outfits. I must warn you that the Star Wars phase–your gifts are terrific–may continue for quite some time. My 40 yo son still has his AT AT Walker, TIE fighter, Landspeeder, Millenium Falcon. . .(you get the idea! )–in MY garage. 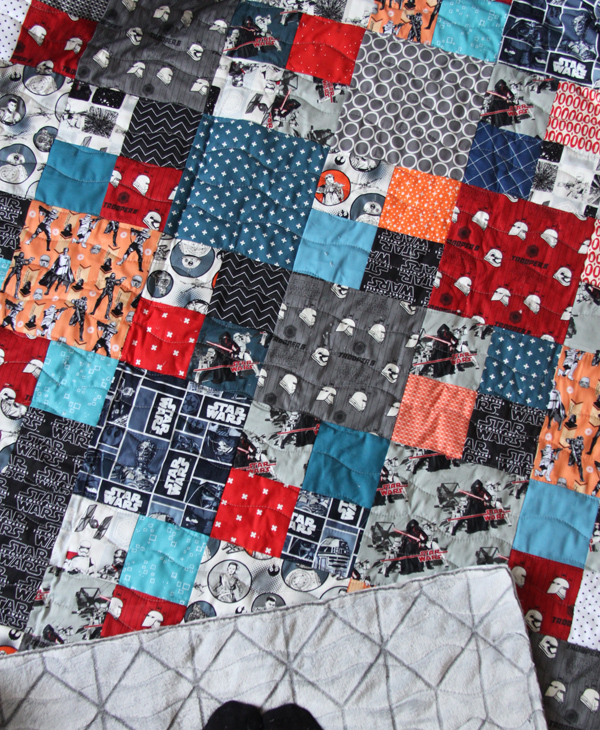 What a beautiful Star Wars quilt! My 6 year old son would go crazy getting one like that ☺I really like your colour scheme. My 3 year old would love a quilt from this fabric! Could you suggest on how much fabric you bought of each or is it a fat quarter bundle? His bed is a queen size so I would need to make a pretty big quilt! Love love love this quilt! I just bound it normal, with the same 2 1/2″ cotton binding strips and it seemed fine. If it’s extra thick you could increase it to 2.75″ strips but I didn’t need to. My kids use these quilts (minky backing and thick batting) year round with no other quilts on their beds in the summer. It seems to be just enough in the summer and in the winter we throw another blanket on sometimes!